We are working to fund one semester of our Urban Roots Science Garden Program at PS84, an underserved public elementary school on Manhattan’s Upper West Side. This hands-on science garden, located in an enclosed rooftop courtyard, currently has 210 sq. ft. of planters and a small greenhouse that are used to grow a wide array of vegetables -- eggplant, spinach, radishes, tomatoes, cucumbers, peas and beans -- which are planted, harvested and eaten by the students. This garden is used to teach every student in the school critical environmental concepts and nutrition. Experiences to enhance literacy and social studies. The program builds on the knowledge and expertise of the science garden specialist, like a librarian in the library or a math teacher in the math lab. Following a cross-disciplinary approach, this specialist co-teaches with classroom teachers. This valuable experiential learning method is not yet supported in the traditional school budget (nor is a science teacher, unfortunately); that is why your donation is crucial. We have a skilled science garden educator in place, the garden has been constructed and is ready for planting, we have support from the school administration and the teachers and we have a wonderful group of parent volunteers to assist the program. The curriculum has been written for each grade, incorporating Core Curriculum elements. $6,000 will fund one semester of the program. P.S. 84 serves a diverse community where approximately 60% of the urban children are receiving free or reduced lunch. Some children eat three meals a day in our cafeteria, so it is paramount to develop healthy eating habits and a love of freshly made foods, especially vegetables and legumes. When Children GROW things, studies have shown that they are more likely to EAT and LIKE them. Knowing this, it is our priority to develop our Garden into a Learning Space about nutrition, and connect our urban children to the soil. These children all live in an urban community and have little or no connection to the natural world. The roof garden gives children a beautiful new outdoor “science classroom,” as well as an opportunity to understand ecosystems while planting. PS 84 currently has no funds to support a full time science teacher and the children’s science education is lagging. By creating a school garden, we are able to enhance approximately 30% of their overall Core Curriculum science learning. 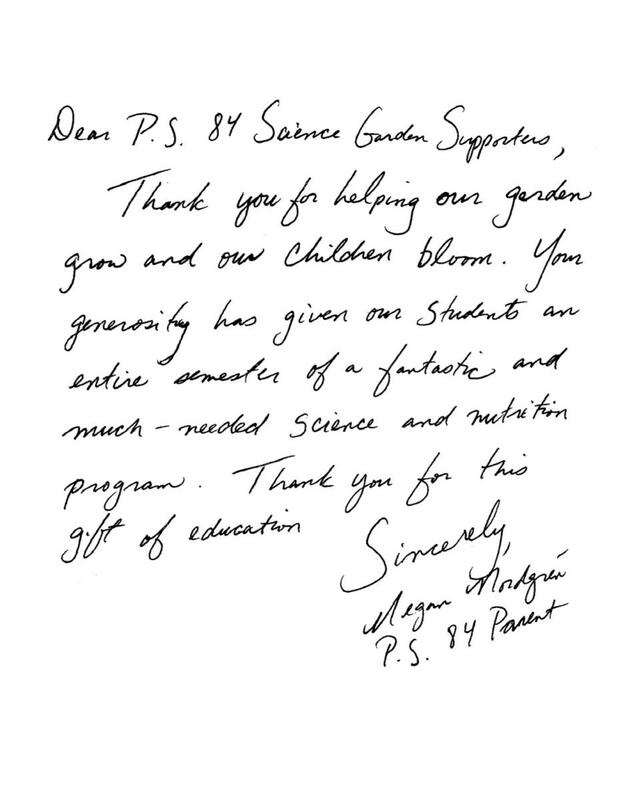 $6,000 will fund 1 semester of teaching by our science garden educator and master gardener. She will teach 120 lessons to K-5th grade classes. We have received funding for supplies from grants, but grants do not fund the teaching - the most critical element. Volunteers can help to work in the garden, planting and maintaining the vegetables.